My lover spoke and said to me, “Arise my darling, my beautiful one, and come with me (Song of Songs 2:10 NIV). Looking back on those early days, what I was really saying was that I wanted to be pursued. None of this blanket invitation for the entire fall business. I wanted to be wooed and won. Even though he had me the moment I saw him sitting on the shag carpet floor, I didn’t want him to know that. I wanted him to show me I was worth putting forth the effort to capture my heart. Isn’t that the desire of every woman’s heart? And nobody does it better than God. Everyday He proves that you are worth it! In God’s all-out pursuit of my heart, of your heart, He sings through a child’s voice, speaks through a bird’s call, shouts through the claps of thunder and calls out through the rising sun. What is the key to experiencing God’s passionate pursuit? It’s simple really. We must recognize and acknowledge His presence as we live and move and have our being in Him. Acts 17:28 must be more than a nice Bible verse; it must become a way of life. When it does, sudden glory moments will fill our lives and take our breath away. It is a divine romance of the purest kind. Dear Lord, I swoon thinking of how You pursue me. Help me to recognize Your love notes throughout the day. I am my Beloved’s and He is mine. Today, consider reading the story of the Samaritan woman whom Jesus met at the well (John 4:1-26,39-42). Look at the great lengths He went to pursue her heart. Remember, this was a time in history when men did not speak to women in public. Jews did not enter Samaria. Women were not allowed to study under a rabbi’s teaching. And here’s another tidbit. This was the first person that Jesus told that He was the Messiah. A woman! How does it make you feel to know that God went to such great lengths to pursue this woman’s heart? How does it make you feel to know that God went to such great lengths to pursue YOUR heart? We tend to read the Gospels with our twenty-first century eyes. But when we understand how oppressive the culture Jesus stepped into was against women, we begin to understand just how radical Jesus’ ministry, messages, and miracles were at setting women free. He risked His reputation to save theirs…and yours. 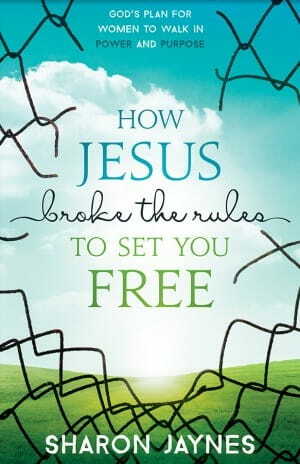 My book, How Jesus Broke the Rules to Set You Free: A Woman’s Walk in Power and Purpose,is an insightful look at every encounter Jesus had with women while here on earth. It also has an accompanying Bible study. Just watching the quick video will make you feel loved! Check it out and fall in love with Jesus all over again.